9271977, the artist responsible for vandalising Prada Marfa, was arrested this week in relation to the incident. He now faces charges of arson, vandalism and criminal mischief. We caught up with the tired and overwhelmed artist to talk about his intentions, straight after he'd got out of jail. "I did Prada Marfa, or TOMS Marfa, as a calculated event, something that needed to happen," says 9271977, whose real name is Joseph Magnano. "I first visited the installation back in 2013 and found myself very dissatisfied with the piece. I didn't know much about the artists, or the installation, apart from the fact that it's a fake Prada store and a critique on American consumerism. I wanted to build upon it." 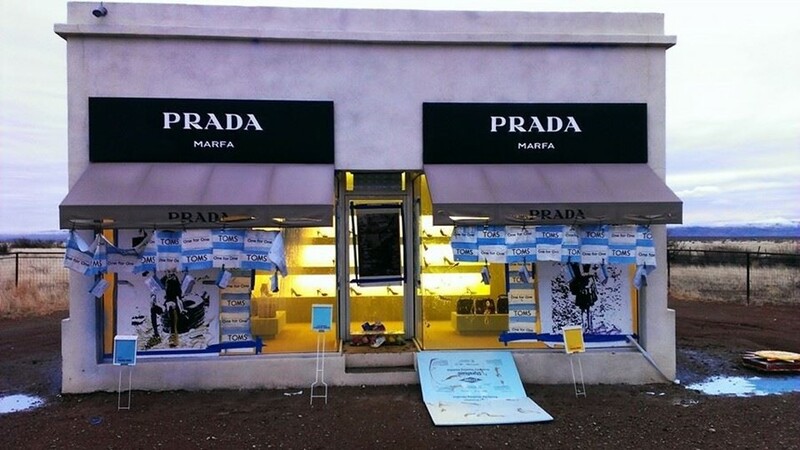 For the hit on Prada Marfa, Magnano handmade TOMS posters and sewed all the banners himself. As for why he draped their logo all over the shop, it turns out that Magnano actually used to work in a store that sold a lot of TOMS. "I've seen first hand how intense the fanaticism behind the brand is," he says. "I started thinking about the environmental impact of TOMS and did some research. They aren't local friendly, they're not community friendly, all they care about is their bottom line. They outsource to China; they're just smart business people that promote themselves differently. They're evangelical with their methods too, so I wanted to challenge what their company is all about. I wanted to swap one brand for another and make people think about American consumerism." In contradiction to outrage sparked by his actions, including the criticism he received from the creator of the installation himself, Magnano believes that he's not guilty of anything: he just put one artwork on top of another, and it was fair game. "There was no destruction here," he insists. "Prada Marfa was just a canvas for TOMS Marfa. That's how I view it one hundred percent, I stand by that and I believe in it. It was absolutely art and nothing else." After widespread media speculation about the whereabouts of the artist, the game was up for Magnano when his car was pulled over for a simple license plate misdemeanour. Police arrested him because his front licence plate wasn't on, but later linked him to Prada Marfa vandalism. "I had a warrant out on me – but for arson, endangering people and criminal mischief," he says. "I thought there was no way he could be serious. There was no-one was around when I did it. They set my bail at the maximum they could: $20,000. They wanted to make an example out of me." Michael Elmgreen, the co-creator of the installation, slated Magnano's "opportunism", describing his hit on Prada Marfa as "cowardly and vain". Magnano remains undeterred by the criticism. "I was kind of sad, "Magnano says. "I'd thought they'd see see the message. He said I was being opportunistic and he was right: I was. I knew this could get attention round the world, but I wanted to use it to open a conversation about something else. Your art is nothing if it's not out of the studio. It's not about vandalism. I was a little upset to hear him say this, I thought that we were both saying the same thing." "Nine years ago, Prada was the right brand to be an anomaly in the middle of the desert, but now we live in a TOMS culture. All this guy seems to care about is being iconic, he isn't actually interested in the re-orientation of things. If I had done Prada Marfa and someone else had challenged it, I know I wouldn't be pissed off about that. I stand by it one hundred percent, even after being arrested."